This volume explores the contemporary challenges to US national cybersecurity. Taking stock of the field, it features contributions by leading experts working at the intersection between academia and government and offers a unique overview of some of the latest debates about national cybersecurity. These contributions showcase the diversity of approaches and issues shaping contemporary understandings of cybersecurity in the West, such as deterrence and governance, cyber intelligence and big data, international cooperation, and public–private collaboration. The volume’s main contribution lies in its effort to settle the field around three main themes exploring the international politics, concepts, and organization of contemporary cybersecurity from a US perspective. 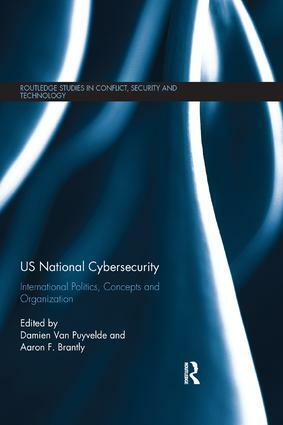 Related to these themes, this volume pinpoints three pressing challenges US decision makers and their allies currently face as they attempt to govern cyberspace: maintaining international order, solving conceptual puzzles to harness the modern information environment, and coordinating the efforts of diverse partners. The volume will be of much interest to students of cybersecurity, defense studies, strategic studies, security studies, and IR in general. Damien Van Puyvelde is Assistant Professor of Security Studies at The National Security Studies Institute, The University of Texas at El Paso. Aaron F. Brantly is Assistant Professor in the Department of Social Sciences and the Army Cyber Institute, West Point, USA. He is author of The Decision to Attack: Military and Intelligence Cyber Decision-Making (2016).